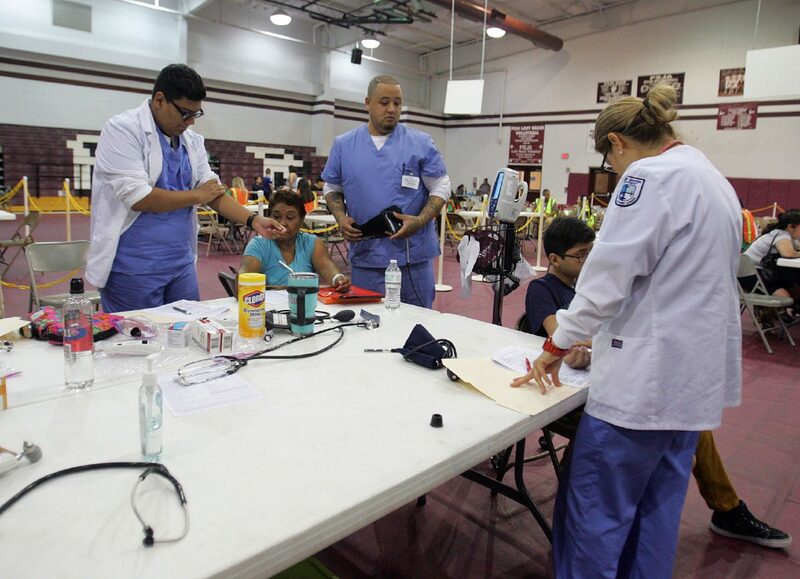 Vitals are taken from patients during Operation Lone Star at the PSJA Early College High School July 27, 2017, in San Juan. McALLEN — The annual Operation Lone Star will be opening it’s free clinics starting Monday at six locations throughout the Rio Grande Valley. The healthcare services — including child immunizations, sports physicals, and screenings for hearing, vision, diabetes and blood pressure — will be available starting Monday and continuing through Friday. 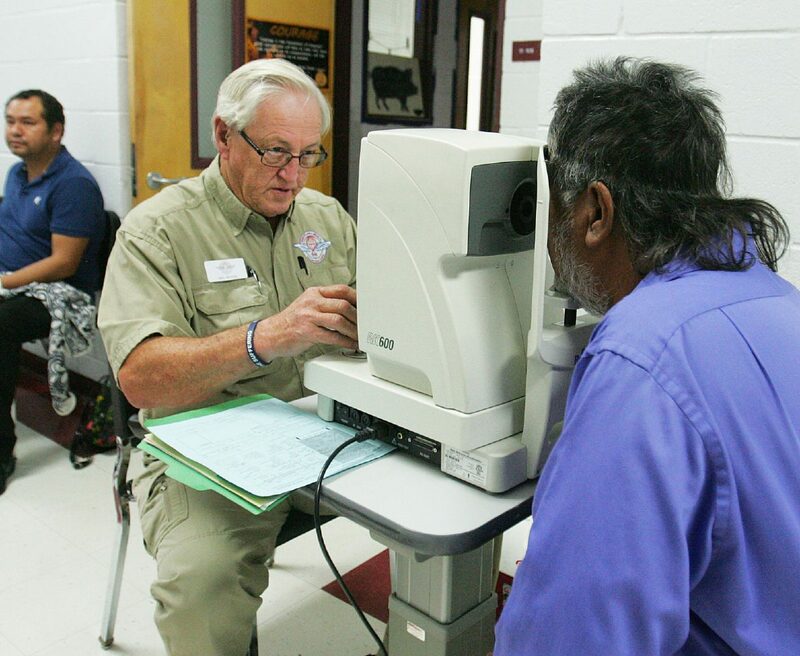 Bill Slover, of Remote Area Medical, examines a patient for unevenly curved corneas using a ophthalmometer during Operation Lone Star at the PSJA Early College High School July 27, 2017, in San Juan. Sgr. 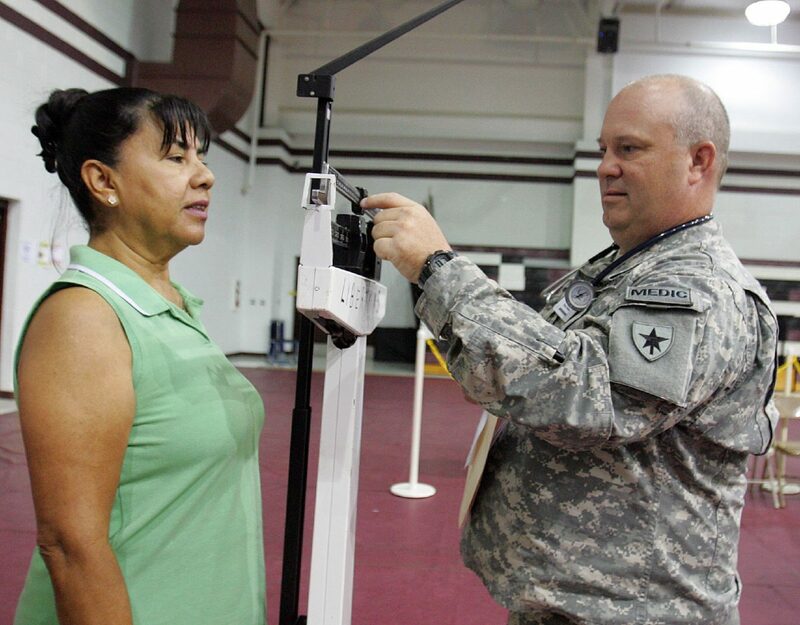 FC Mark Butler takes the height and weight of Anna Morales as free health care is provided during Operation Lone Star at the PSJA Early College High School July 27, 2017, in San Juan.  Rio Grande City: Ac2E Magnet Elementary, 1 S. Fort Ringgold St.
 Laredo: Jesus Martinez Performing Arts Complex, 2400 San Bernardo Ave.
 La Feria: La Feria High School, 901 N. Canal St.
All locations will be open from 8 a.m. to 4 p.m. Monday through Thursday and from 8 a.m. to 2 p.m. Friday. The Rio Grande City location will also provide preventative dental services for school-age children, states a news release from the Texas Health and Human Services, which coordinates the event. The Brownsville and San Juan Locations will also offer dental services and vision exams for prescription glasses for adults and children. For additional information, contact your local health department or dial 2-1-1.